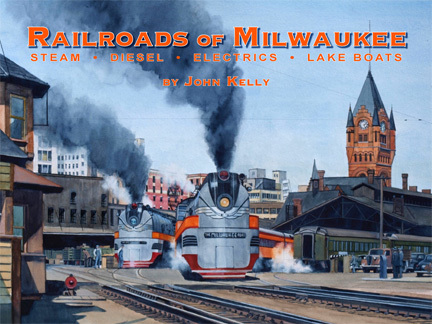 In this new 9" x 11¾" 264-page book, 68 pages of which are in full color, author John Kelly explores the fascinating history of the city's railroads, starting with the Milwaukee & Waukesha in 1847. By 1873 the Milwaukee & St. Paul Railway—later the Chicago, Milwaukee, St. Paul & Pacific ("The Milwaukee Road") opened a line to Chicago and the railroad was on its way. The Milwaukee Shops and the Hiawatha legend, Skytops and Super Domes, and the story behind designer Brooks Stevens, are also featured. Kelly supplies copious data on not only the Milwaukee Road, but also the Chicago & NorthWestern's freight and passenger service, including the 400 fleet. Kelly also writes about the Chicago North Shore and Milwaukee Railroad, America's Fastest Interurban, the Skokie Valley Route and Electroliners. In the Milwaukee Electric Railway & Light Company section, he reviews streetcars, interurbans and trackless trolley buses. With the inclusion of the Lake Boats, the Pere Marquette, Chesapeake & Ohio, and Grand Trunk Western RR’s also come into the picture. In addition the book covers the Beer Line and the breweries, Milwaukee's meatpacking industry, Milwaukee's railroad stations and freight yards— a recipe for some great railroad reading. Generously illustrated with 135 color and 362 black and white photos, maps and drawings, this limited edition volume will be available in hardcover and is a treasured keepsake for your library. Hardcover, 9 x 11¾", 264 pages, 135 color and 362 black and white photos.